It was an instant connection, from the first time we spoke on the phone until the day of today, 6 years later. Heather Tackling-Court and I became instant friends. It was almost like “Just add water and Stir and VOILÁ”: instant friendship. Her easy going personality along with my craziness apparently made a great connection and I am lucky to count this power woman amongst one of my dearest friends. With the St. Maarten Heineken Regatta just a few weeks away it only seemed logical to feature none other than the event’s long time director Heather as this month’s Island Girl. Heather or “Hedda” as the locals call her, was born on French St. Martin to a British father and an American mother. She grew up on Dutch St. Maarten where she fondly remembers her life as an island kid, barefoot, riding her bike to the beach after school and horseback riding with best friend Clara. At age 13 Heather was sent to boarding school in Fort Lauderdale, Florida. Her parents felt that a US education could be better for her. In protest for being made to leave her island life and friends behind she refused to do or participate in anything in school. The school then reiterated by politely asking her not to return. An all girls boarding school in Virginia followed. But being an island kid, Heather got along better with boys than with girls. Girls are known not to play so nice. So after a year in Virginia she convinced her parents that boarding school was not for her and she was back in Fort Lauderdale, this time accompanied by her mom who moved with her. 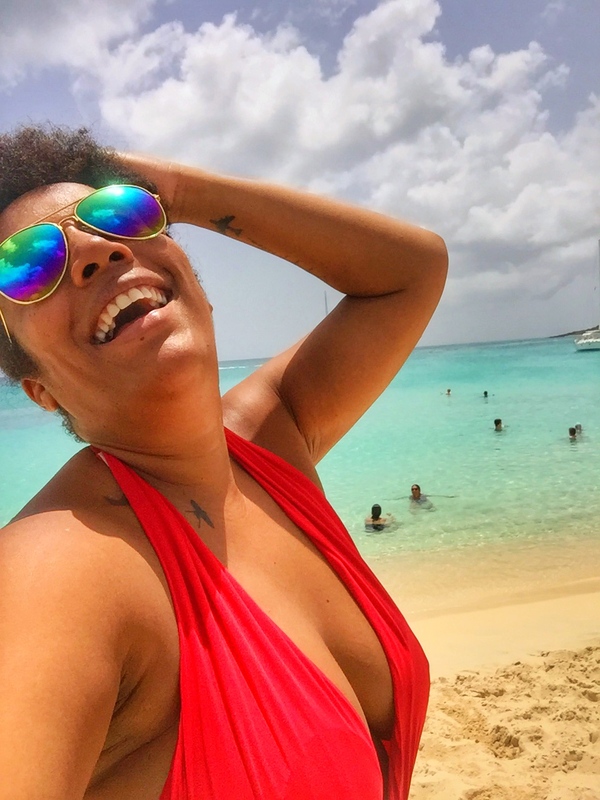 She started attending regular school and after graduation started college at the University of Central Florida but every single vacation was still spent on St. Maarten. St. Maarten was her home. The people she grew up with and surrounded herself with became her uncles, aunts, cousins and siblings, besides of course her parents and sister Christianne. The island was where her family was. It is where she used to get “sate potato” at the Chinese restaurant everyday after school, put it on her father’s tab and share it with friends on the beach. It was where she would go horseback riding on weekends with no helmet, saddle or shoes on. And it was where she never broke anything and was free to be a kid. St. Maarten was and still is home. The day after graduating college, with her degree in marketing in hands, Heather was back on the island for good. She started working at her boyfriend’s stables. She and Rodney had met during one of her visits to St. Maarten while she was away for school and started a long distance relationship. Shortly after however, disaster struck in the form of a hurricane that completely destroyed the stables. The young couple found themselves in a difficult position and decided to pack up the horses in a container, move to Aruba where Rodney was from and set up shop there. By this time she was married and pregnant with their first daughter Gabriella. The family lived in Aruba for a total five years but still spent every vacation on St. Maarten. Realizing how ridiculous the back and forth was the young family then decided that it was time to move back to St. Maarten. Here is where it gets interesting…..
Heather then started the job that would catapult her career and make her one of the most recognized names on the island. She started working as Assistant Director for the St. Maarten Heineken Regatta, the island’s most prestigious and internationally recognized annual event. Right around this time she became pregnant with her second daughter Aryanna. But she was determined not to let that slow her down. Just a month after giving birth she was back at the job, baby Aryanna in tow. She would set up the baby in a corner in the office where all her colleagues would help take care of the infant and set to work to make yet another successful regatta. Two years after she started she became the event director. Not an easy task for a young mother of two and many doubted she could do it but she was driven to prove them all wrong. For a total of seven years she gave the St. Maarten Heineken Regatta her all, sacrificing valuable personal time and time with her kids and husband. She learned a lot though; about business, about life and about herself. After five years of pouring her heart and soul into this event and now in the process of separating from Rodney, Heather had reached her limit. She had no energy left and gave her two year notice to the organization. Heather, always professional wanted to make sure the transition went as smooth as possible and so she spent her two remaining years on the job training her protégé and thus ensuring that the event she came to care for so much would be in good hands. Heather’s last year on the job was especially memorable. She ate, slept and breathed the event for so many years that it was hard to walk away from it all. She always had to be on, selling the event, getting people to participate, begging for sponsorship. She was exhausted but at the same time she wasn’t sure how to go about without the regatta in her life. At the end of her final regatta when thousands and thousands of happy people were in front of the main stage where the prizes were just given out she went into a corner and just sobbed. Her 7 year tenure was over. It was a bittersweet moment. A few years before, she had met a young Dutch intern who volunteered at the event and they started a friendship. Just a few years later, the then separated Heather fell in love again. She and Jorn started a long distance relationship and saw each other every opportunity they got. It wasn’t long before Jorn invited Heather to visit him in the Netherlands and the idea to move there was born. After the girls visited and liked the Netherlands and after discussing it with Rodney and the girls, Heather decided that the move was in everyone’s best interest. School opportunities were better there, the island was no longer the same and and she wanted something different for the girls. The Netherlands seemed to offer just that. Besides, the moment was right for a big change. She was no longer working, she and her husband had divorced amicably by now and she was ready to start a new life alongside Jorn. It all just clicked. Heather packed her two kids, two dogs, a cat and a her Harley Davidson and started her big new adventure in Drenthe, a small town in the north of the country. What was the worse that could happen? If it didn’t work out she could always move back. She decided to take a year off to decompress and destress and became a stay at home mom. She was excited to finally be able to take care of the girls the way she always wanted to and to be there for them. But she was not prepared for the solitude that came with it. She went from being someone important at her job to being a stay at home mom that cooked and cleaned and with a complete different social circle than what she was used to. The first three months were torture. She doubted her sanity many times during those first difficult months, asking herself what the hell she was doing. But then she started volunteering at a horse stable that gave horseback riding classes to the handicapped and she loved it. She started playing tennis, took an art class and spent more time riding horses. She started doing all the things she had to give up over the years to raise kids and to work. Then it happened…..one beautiful sunny day when she was driving to pick up her daughter Aryanna from school she realized how lucky she was to get to have lunch with her daughter. She actually got to spend time with her, ask her how her day was and watch her at her gymnastics class. The girls had to adjust to their new lives as well. Living in the Netherlands meant freedom. Freedom to take their bike and go wherever they wanted (with their mom’s permission of course). Teenage daughter Gabriella was especially enthralled by this idea. Aryanna on the other hand was a bit more confused at first by the idea that she now did not have to wait for her mom to pack her bike and take her somewhere safe to ride it. She could now ride down the road or to school all by herself. The move to this new country proved to be a great idea. Drenthe offered her kids the opportunity to live a life filled with the freedoms Heather had growing up on St. Maarten of yonder years. Heather and the girls were not the only ones that needed to adjust to their new lives. Jorn went from bachelor to instant father and live in boyfriend complete with a house and pets. Being 10 years younger it was quite an adjustment. Heather understood this and made sure he always had his alone time when he came home after work and that he needed to decompress before coming downstairs and be step-dad to two girls. But Jorn is an easy-going guy and it wasn’t long before he was completely adjusted and happy with his new life and new role. Life in the Netherlands by now was going smoothly. Heather got used to being by herself when Jorn was at work and the girls at school, the work on the home they just bought was all completed and she realized that quality trumped quantity when it came to friends. So what, if she had fewer friends in Drenthe? Her closest friends were back home in St. Maarten and only a Skype call away. Cultural shock over and and finally completely de-stressed, it was time to go back to work. But faith had other plans and Heather found herself pregnant at age 39 and a new mom at 40. Little Dylan arrived like a hurricane and turned their lives upside down but he was also the glue that bonded the family and made it one. Dylan was the final piece that joined the two families together. She has gotten used to the rules though and even appreciates some of them, like the unspoken rule that one never calls or drops by around dinner time. The rules work and make for more smoother living. Heather has even gotten used to how to close Dutch doors and how to order a proper hamburger in the Netherlands. Heather has no plans to move back to St. Maarten any time soon. Even though St. Maarten will always be home. Still, she misses Mullet Bay, her friends and especially the choices of different types food St. Maarten offers. The community of people on the island that she considers family is definitely something she misses everyday. She went from meeting friends after work for a drink or meeting for lunch to now being invited over for tea. Read Heather’s blog My Dutch Life for her not too Dutch observations as an island girl in Drenthe and check out the St. Maarten Heineken Regatta website for information on this annual event, with a winning combination of serious sailing and serious partying taking place from March 4th to the 6th. Do you know someone who should be next month’s Island Girl or do you want to be featured on The Traveling Island Girl blog? Contact me. Don’t be shy and let your story be heard. Heather is one of my sweetest neighbours, always willing to help despite her busy life. We love her and her lovely family very much. Heather is indeed a sweetheart. We miss her here on island. Thank you for commenting, Janny.